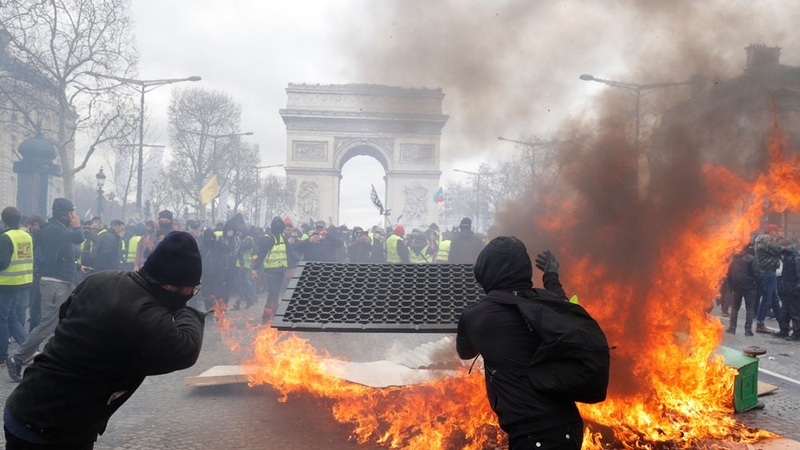 French “yellow vest” protesters have clashed with police in Paris, in the 18th straight weekend of demonstrations against President Emmanuel Macron and his government’s policies. One dangerous blaze targeted a bank on the ground floor of a seven-storey residential building. As firetrucks rushed over, a mother and her child were rescued as the fire threatened to engulf their floor, Paris’s fire service told The Associated Press news agency. The turnout was seen as a test for the “yellow vest” movement, which began in November over fuel tax hikes and quickly ballooned into an anti-government rebellion but has struggled lately to mobilise large numbers of protesters. The movement against Macron’s perceived bias in favour of the elite, takes its name from the yellow safety vests French law requires all motorists to carry. Around half a million people turned out at townhall-style meetings held around the country, but many “yellow vest” protesters dismissed the consultation as a smokescreen.